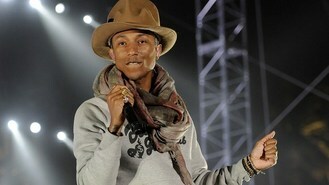 News - Pharrell: I hung up on MJ - twice! Pharrell: I hung up on MJ - twice! Pharrell Williams has revealed how he hung up on Michael Jackson twice, because he thought he was a prank caller. The Happy star and music producer revealed on Jimmy Kimmel Live how he was working with Justin Timberlake on his debut solo album when the king of pop called and he thought it was someone playing a joke on him. "Third time, 'It's really Michael Jackson'. So I pick up the phone and he's like 'Hello, how are you? It's Michael,' Crunch crunch crunch - eating popcorn in my ear and that's when I knew it was him!" When he realised his mistake, the Get Lucky star tried to make amends. After Pharrell replied "Yes sir," the late singer said, "That's good, that's amazing. Cool. Well, have a good time, see you later." He exclaimed: "That was the king, the king eating popcorn in my ear!" Michael Jackson's enormous fame and high-pitched voice meant Pharrell is not the only person to have hung up on him. Will.i.am and Ne-Yo have both recalled similar experiences with the pop legend. CeeLo Green was offered Pharrell Williams' hit track Happy, it has emerged, but his team turned the song down. A guitar owned by George Harrison is heading to auction in the US along with other Beatles and rock memorabilia. Molly Smitten-Downes has created the perfect Eurovision winning song according to a formula from experts at the London College of Music. Veteran US rockers Metallica have been announced as the Saturday night headliners for this year's Glastonbury festival. Goths rockers The Horrors have revealed that they are unlikely fans of Beyonce. Led Zeppelin haven't ruled out the release of more previously unheard material. McFly are reportedly scrapping plans to record a sixth album, in favour for a joint record as McBusted. Miley Cyrus is set to liven up the summer, after being the first act confirmed to perform at the Capital Summertime Ball 2014. Ed Sheeran has returned to the pub he used to play at before he was famous for a secret gig.